Last week Neil Bartlett and I gave a masterclass in Girona. We had a very good crowd: 10 very clever people. The first day was an introduction day but we learned the second day that we had to repeat some of the introductory material on the first masterclass day. The key reason was that even the most experienced users were not really aware how easy it is to use µservices with the bnd component annotations in bndtools. The days were pretty intensive, going from 9 in the morning to deep in the evening. Though we stopped around 6 in the afternoon, we then tended to just move to the lobby and continue discussing and exploring. The lobby was the only place with Internet, though this sounds limiting, the effect was that we all had a good time together instead of sitting in our rooms working alone. One of the first things we did is play with Vaadin. We used a little bundle I wrote some time ago that made it trivial to build a Web GUI with Declarative Services. We then continued with configuration. I discovered some really cool stuff just doing these exercises. Though I was the author of the Metatype specification, I never really used it since then, though I heard that the Apache Felix Webconsole supported it very well (as long as the Metatype Service is installed). A Metatype defines a type for a configuration record with sufficient information to automatically generate a decent UI for this type. It was kind of magic how a little bit of XML in the bundle suddenly allowed you to control the configuration of the component as well its number of instances. I knew it could be done, just did not realize how powerful it is. To work on these examples we used Neil's Auction application he used for his tutorial. In this application, an Auction is (obviously) a service. Now would it not be cool to see the auctions of the others in the room? Seems like a job for Distributed OSGi! 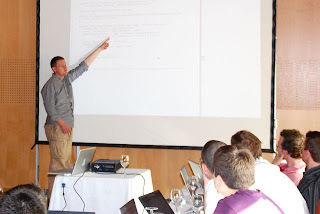 Before the masterclass Neil had investigated the existing open source implementations for the Remote Service Admin but they were either not up to the standard yet or not robust enough. So we had asked Paremus to provide us with a copy of their Remote Service Admin (RSA) implementation. They were still in active development so there was some reluctance from Paremus but they were fortunately brave enough and it paid off, RSA worked like a charm! In the end we all got each other's auctions on our screens. Distributed OSGi looks like a clear winner. The next thing we tried was persistence. The last enterprise release provides a way to use JPA based on services. I'd never tried it so we decided to see how it works. I guess I should have prepared this part because it initially went badly. I mistakenly used the Eclipse Link bundles because they mentioned OSGi, however, it turned out that they were not at all related to the OSGi Enterprise specification. After we wasted too much time I got the brilliant idea (not really) to check how we tested the OSGi specification and then noticed that the Eclipse Link bundles we used there did not even remotely resemble what we were using. It turns out that all this work is in the Eclipse Gemini project and this is still in incubator status. Desperately after wasting so much time I used the bundles in the OSGi build. You can find now some information at the Eclipse Wiki but this desperately needs a good example. In the end we got it work thanks to Ralf Ebert who persevered. Three attendants came from ACA-IT and used the week to work on a little Web based message aggregator based on the technologies we explored in the masterclass. They really wanted to use websockets (two way communication between browser and server) but these were only available in Jetty 7. Using parts from Felix and Equinox they actually got this to work. It was really nice to see how they leveraged the knowledge learned during the day to add this to their app during the night. During the days we discussed an amazing amount of information. There was a lot of knowledge in the room and we could do some sparring about subjects like testing, versioning, builds, and many of the other things that occupy us as developers. The last day each attendant had the change to submit a question to the rest of the group. This is the part I always like best because you learn about user problems. It was clear that also that day went by amazingly fast and provided a lot of food for thought. We invited all attendants to an exclusive mailing list for ''Masterclass on OSGi'' attendants. It is already working heavily. Neil and I were very tired after this exhausting week but also very satisfied. It had been a lot of fun to do but we also learned a lot. We went out for dinner with my wife (accidentally ending up in an Irish pub with the for Neil oh so familiar English pub food) and evaluated the masterclass. As it looks now we are going to repeat it early next year on the west coast of the US. We'll inform you about the details. Is the material online somewhere? I would like to find out if ECF does not already support your requirements, although we don't fully implement the Remote Admin spec yet. Sorry but there is no downloadable material available. The Masterclass is a little different from traditional structured training with an instructor and an enormous slide deck. 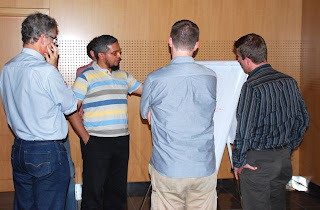 It is more of a free-form discussion and exploration, guided by the interests of the attendees. Of course Peter and I provide explanations where necessary but honestly we did not know in advance what the main topics would be. We will be running the Masterclass again... probably the next one will be in USA in late January or early February.